Never have I been so obsessed with a beauty product as I was with nail polish. Back in Grade 12 / university, I was VERY INTO my nail polish collection. I used to order discontinued ones from Ebay so that I could have certain colours. OPI was my polish of choice (and the ONLY polish I would use) for many years. I was so obsessed with my nail polishes that I knew the name of all 50+ bottles that I owned along with the names of all my friends nail polishes. I was always up to date on the different collections and collaborations that OPI was doing and usually bought a polish from each collection. It was a BIG DEAL when OPI came out with the Shatter nail polishes. I thought it was just the coolest thing. 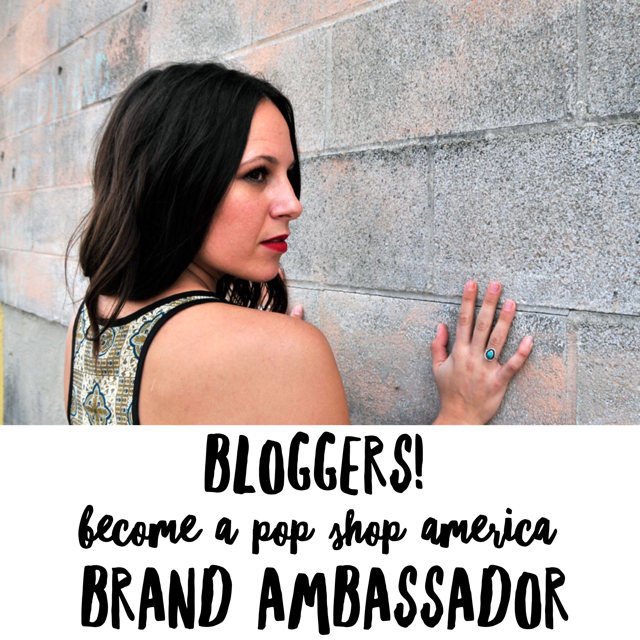 I was seriously into searching for jobs with OPI and at the time felt like I was destined to become a nail polish namer. Super ambitious, I know. I had bottles in every colour of the rainbow and had to make a chart with the names of all the colours so my family would know which ones I had and wouldn’t buy me duplicates for gifts. I had some nail polishes for a long time, so I had to start buying the nail polish thinner to thin them out again. I believe the Christmas of my first year of university I got 6 bottles of nail polish. At almost $15 a pop per bottle, that’s almost $100 in just NAIL POLISH. Looking back now I can’t believe how crazy that is and how much I used to spend on the stuff. I currently still have about 20 bottles of polish from varying brands but have gotten rid of all the crazy colours. You’ll basically only find colours of the pink/crimson/neutral variety in matte shades. I’m slightly embarrassed to admit that I do still know the names of most of them. Needless to say, I still like having my nails done but can’t be bothered to paint them only to have them chip the next day. 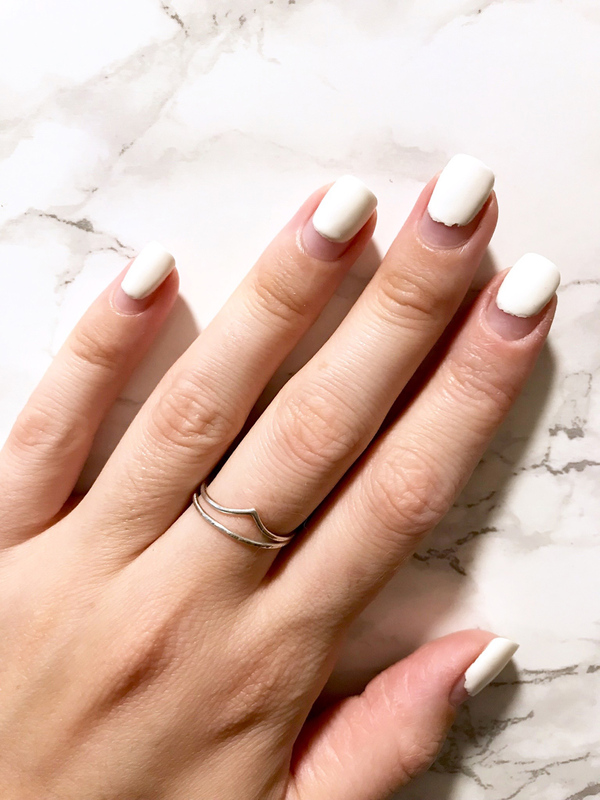 I LOOOVE that you can have fresh looking nails for a couple weeks without any chips. I always feel every so slightly more put together when I have perfectly done nails. The only problem with shellac is that you have the half moons at the base of your nails when it grows out. Sure, you could take it off, but it seems like such a waste when the rest of the polish looks so good still and your nails are so long and pretty. 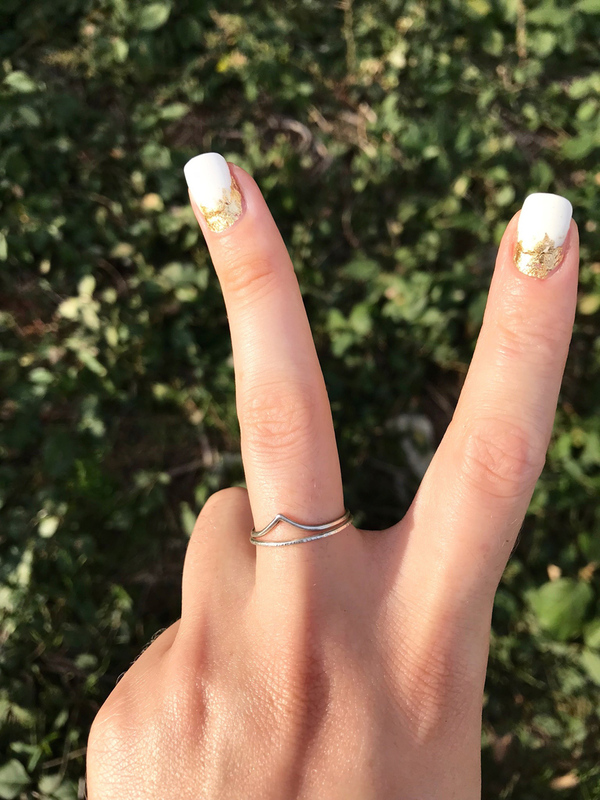 SO, I came up with a cute tutorial for a gold foil manicure to extend the life of your shellac. It’s super easy and looks pretty cool. 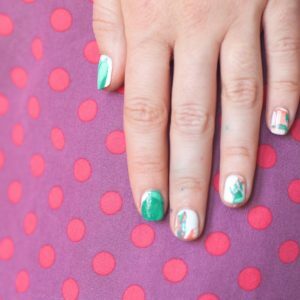 You could always do it as a regular manicure too! Now that your nails are ready, it’s time to apply the gold leaf. Complete steps 3-6 for each nail before moving onto the next one! Take your top coat and apply a thin layer to the base of your natural nail where the shellac has grown out. Wipe all the polish from your brush and then try to feather out the clear coat onto the shellac so that it’s not in a blunt line. You can leave it and only paint the half moon that’s at the bottom of your nails, but I like the more abstract jagged look that it gives if you feather the clear nail polish. There are two ways to apply the gold leaf. 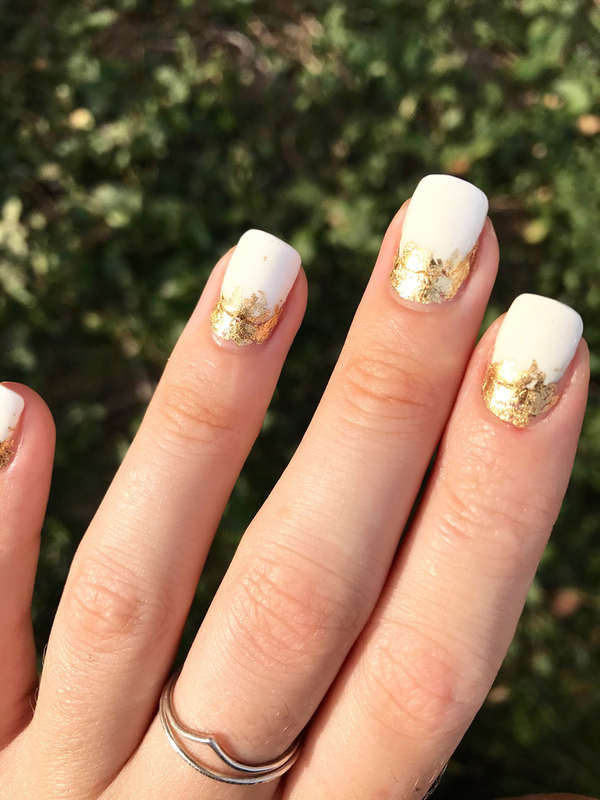 First, try gently ripping off a piece of the gold leaf and apply it to the still wet clear nail polish at the bottom of your nail. It’s ok if you have a piece that’s bigger than your nail bed as it won’t stick anywhere that doesn’t have wet polish. Alternately, you can press your nail into the gold leaf, rolling it from one side to the other so that the leaf sticks to your nail. Use the index finger of your other hand to gently press the gold foil down onto your nail. Using the toothpick, scrape away any gold leaf that is on your finger. 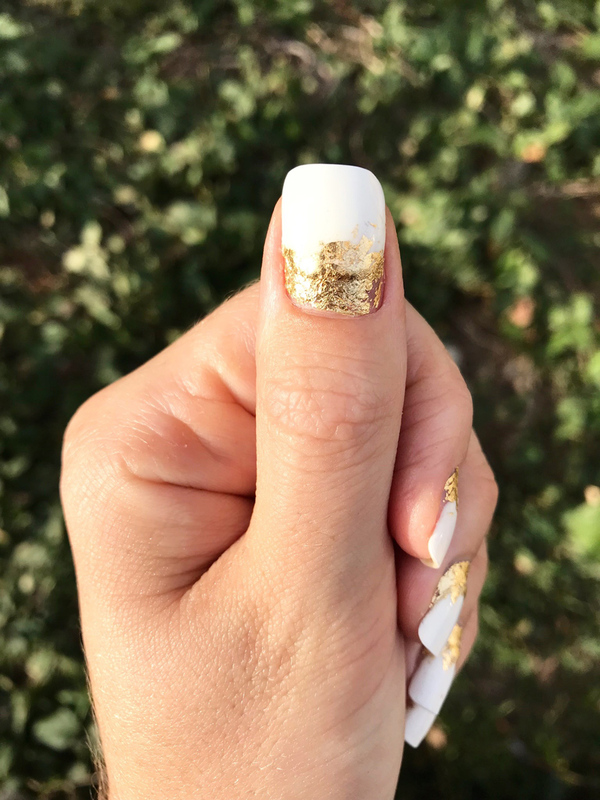 You can also adjust the gold foil on your nail at this point and add any more if there are any spots where it didn’t stick or if you want more of your nail to be covered. 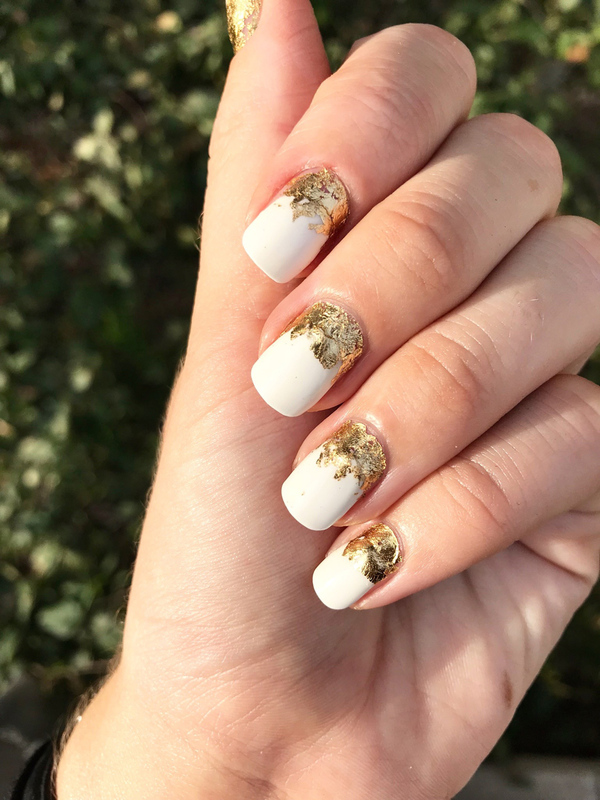 You can also scrape some away if you covered too much of your nail or if the gold leaf was applied in a shape that you don’t like. 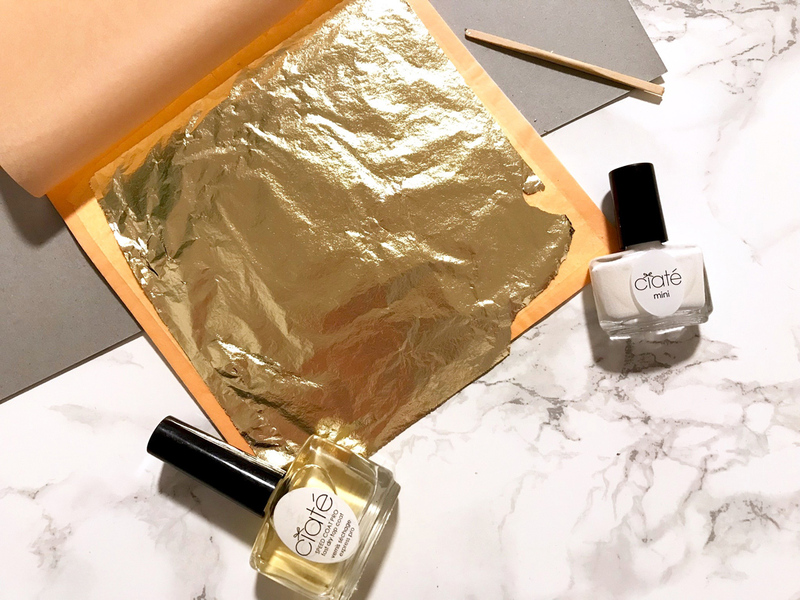 Once all your nails have been covered in foil, apply a clear coat to the entire nail bed. Allow to dry and repeat with a second coat. When the second coat of clear nail polish dries you’re done! You can still kind of see the line where your polish is growing out, but it definitely looks much better than before. 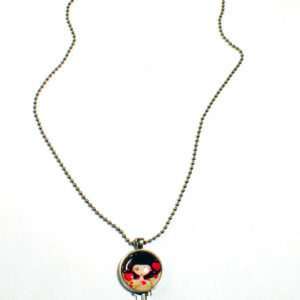 Plus, the pop of metallic is pretty fun! 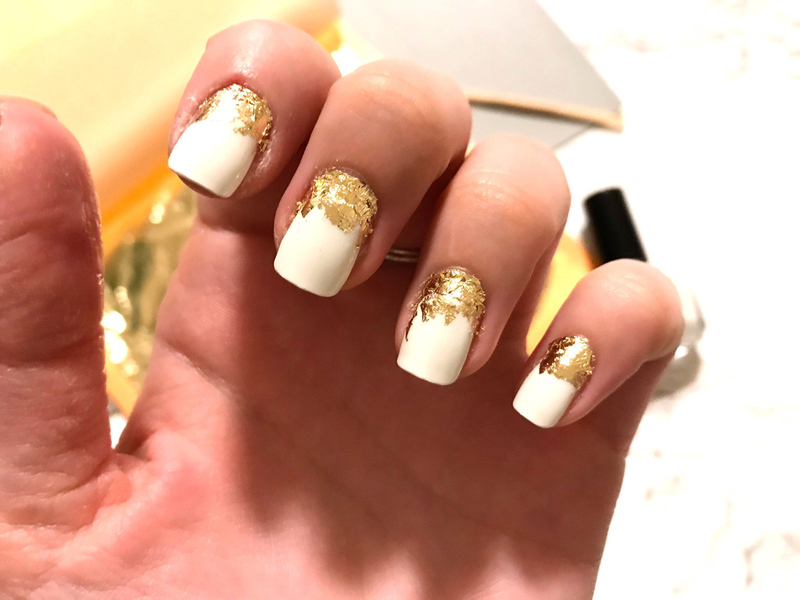 I love the combination of the gold with white. 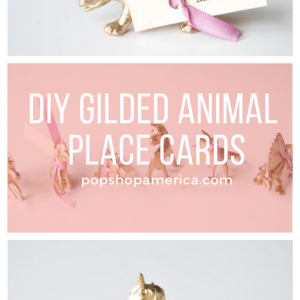 Try mixing up your metals by using a silver or rose gold leaf instead of gold. Or, even try mixing two different leafs on one nail. In the past, I’ve covered a crimson manicure with a rose gold and loved the results. If you have an emerald manicure, that would go great with gold or even silver. 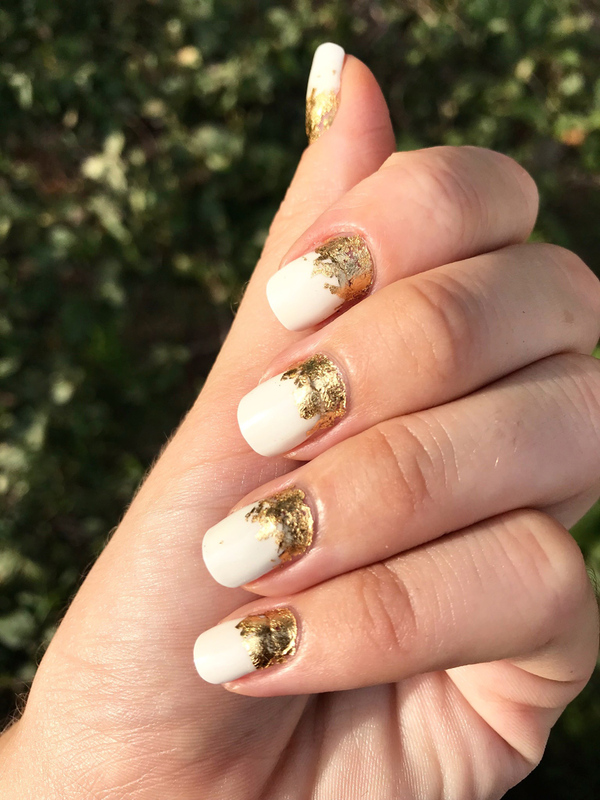 If you’re doing this technique on freshly painted nails, it would also look really cool to apply the gold leaf to just the tip of your nail. 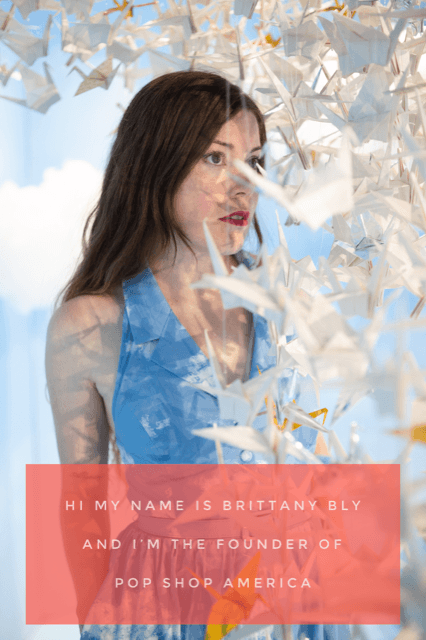 I’d love to know what you think of this DIY tutorial! Would you use it on your grown out shellac? 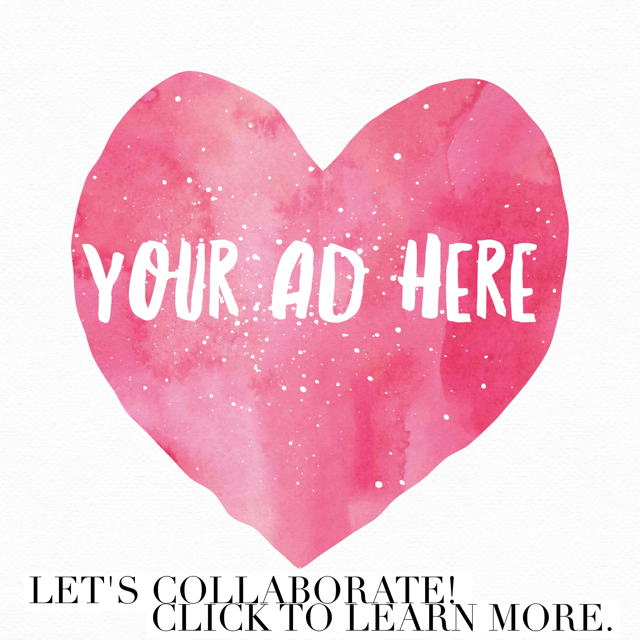 This entry was posted in DIY, Fashion. Bookmark the permalink.